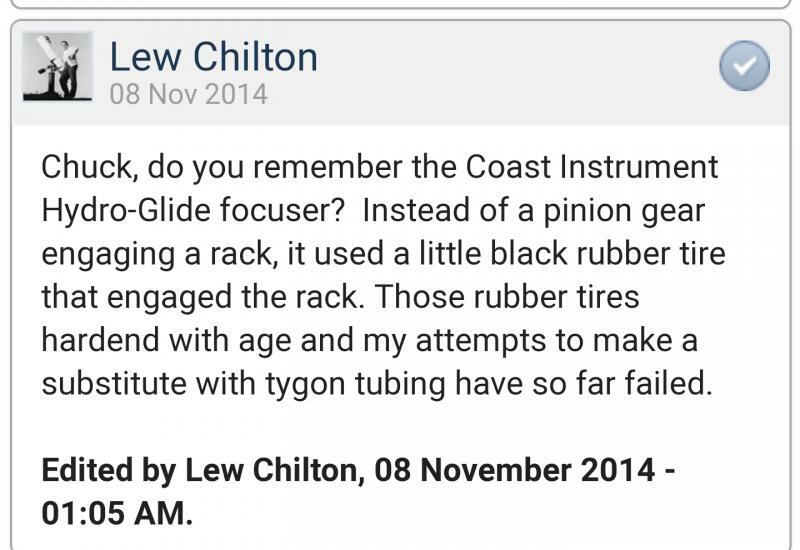 Excellent Robert, Coast “Hydro-Glide”. I think we have a winner! Check out this post from 11/2014. Lew C makes mention of this focuser and describes it perfectly. Post is 2nd page 3/4 down. Edited by Compressorguy, 19 December 2018 - 12:54 PM. I'm sure with a little experimenting a modern equivalent can be found. 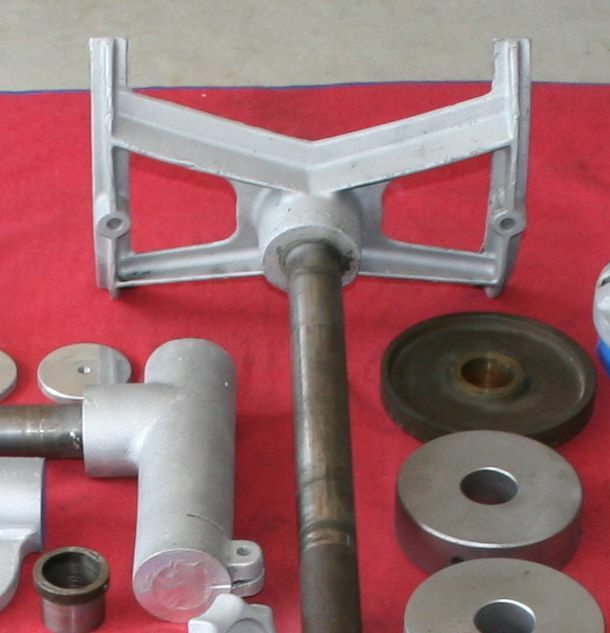 our automobiles to make a new 'pinion' also any of these can be sanded down. tires, faucet washers, maybe even a small fat O ring. 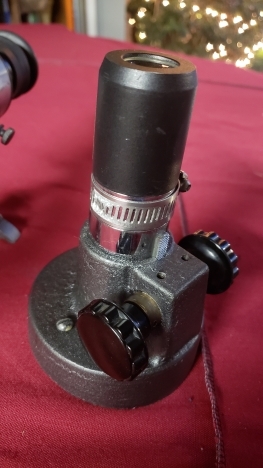 My 1957 8 inch f/7 deluxe has what looks like the same focuser. Comparing your photos to mine, it seems that your pinion bar must be longer. When I put on the knobs it goes flush to the focuser, whereas you have a gap between the knobs and the bushings. I can figure out something to hold the eyepieces in, maybe an extra shim layer in-between to add compression. Without the plastic gear, which might have been rubber at one point but certainly feels like plastic, the pinion bar has zero contact with the focuser teeth even when the bearings are rotated to their closest point. Whether the gear was rubber or a change from the original it's unusable at this point. I can get a new brass gear, which I will, but there is still the issue of how does the gear maintain grip on the pinion bar? The only way I see is if it is wedged between the bearings. 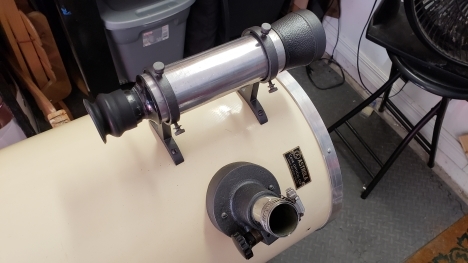 Then again, and I know it doesn't keep the original nature, I might replace with a 2" focuser because I use a binoviewer 98% of my observing anymore. It's easier on the eyes and will work just fine on the Moon and planets. From Riverview, Florida there's no deep sky objects from my front yard. For that, I take the dob out to the club's observing site. My main goal is to do image/stacking on Jupiter and Saturn again, and a 1-1/4" focuser is fine for now. Even IF I change it out I will not get rid of the focuser, but first I'd like to get it back to working order. I'll take measurements of the gear and close-up pics tomorrow afternoon. Can anyone post pics of the gear itself and what it looks like inside once you take the drawtube out? Edited by Guy Earle, 19 December 2018 - 08:20 PM. identified your focuser is the Coast Hydro-Glide. Coast, tried it out, and decided to put the Hydro-Glide on their Cave scope. against the rack gear, it's a labor of love. Or replace the focuser with something else. focusers over the years So I felt I could do whatever I wanted to. 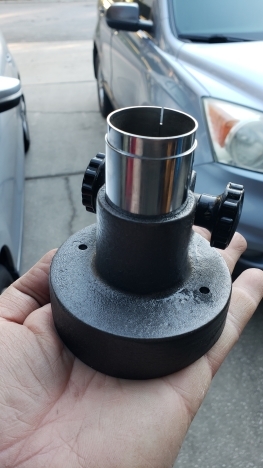 I ended up finding the correct focuser that matches the original holes, and someday I will install it. That's why I think the gear is original because there's only the one set of holes in the tube for the focuser and finder. I planned on taking a day to work on it this week but life said otherwise. I'm going to take a trip up to Ace to see what I can find after I clean it up. I think this perfectly describes the focuser. Edit: I see that the two brass bushings (?) do not have a concentric opening for the focuser knob shaft, and that the idea is to rotate them forward so the focuser knob shaft and gear then presses up against the the focuser tube, but despite all my attempts it sticks too tough and never engages, even when the two brass bearings match on either side. If you are referring to Clint Whitman's restoration of his 10", the compression ring at the top of the focuser was added by him. The original focuser did not have anything up there, just the slotted drawtube that held the eyepiece by friction. 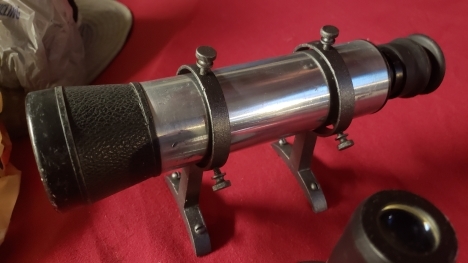 If the eyepiece is falling out, you might be able to squeeze the tube some to get it back to the amount of friction needed to hold the eyepiece from falling out. I don't have time to look now but I remember Coast Treckerscope? advertised their focuser as fluid drive? or hydromatic or something along those lines implying something other than gears, possibly. 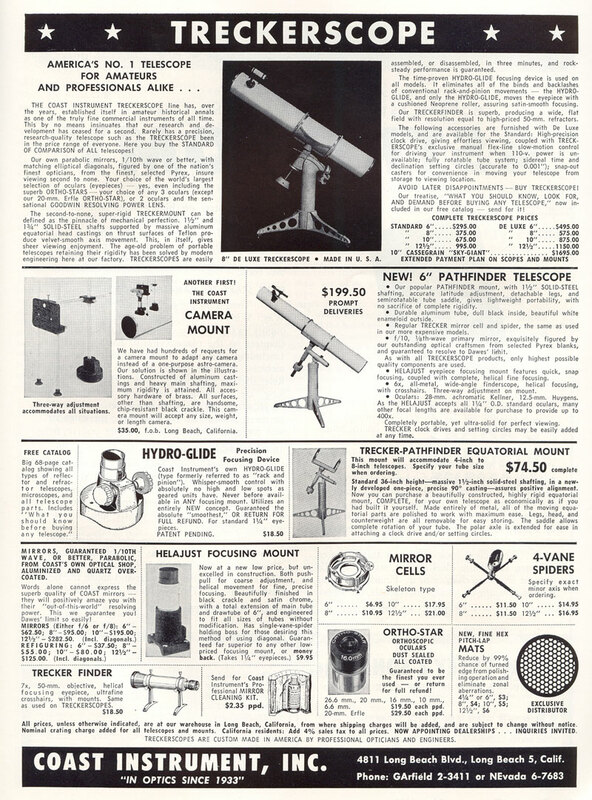 In the ad for the scope at the top of that page it says the pinion is made from neoprene. Just poking around for a source for a replacement. Found these skateboard bushings on eBay. They come in different durometers. These are 96a durometer, I would think you would want something hard enough to stay put on the pinion shaft (tight press fit) with a little cushion against the rack. These would be easy to chuck up in a drill and turn down for correct diameter and thickness. Just not sure about inner diameter of these. Again these may not work but thinking something along these lines. A high durometer material. I had a similar thought to you and Dave, as I stopped by Ace and I think they used faucet washers or something similar that had a bit of a soft touch to them but could stand up to the pressure against the drawtube. I ended up getting a mixed set, but then when I got home they have little flex, so I have to go back and get the ones I was looking at the first time. I'm happy to report I got the Hydro-glide focuser to work. I found that the "0 Flat Washer" (STK NO 35083B 1/4" at Ace Hardware) works well. It's a soft rubber that you can bend, but not too soft. Using hard washers just does not work well, so it was a matter of trying to find that right balance. 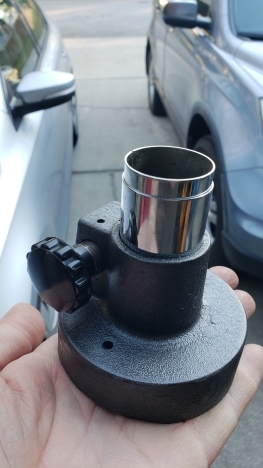 It's a bit thinner, about 1/16" than the original, so I plan on getting a second one to fit next to it and avoid any worst case scenario where the rubber gear disengages with the drawtube teeth. 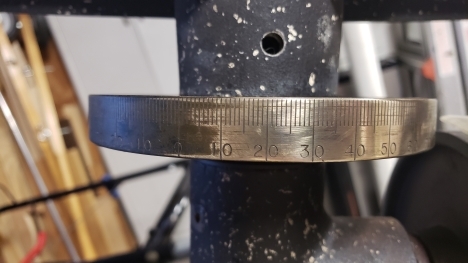 The center hole is a touch smaller than the adjustment bar, which after a quick drill slides tightly onto it and keeps the rubber washer gear from spinning on the bar. 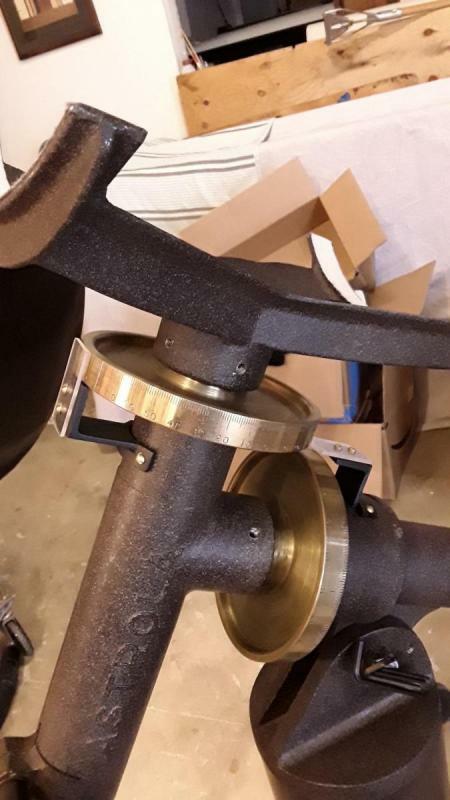 After adjusting each brass bushing and the tension, I got it to go smoothly up and down. 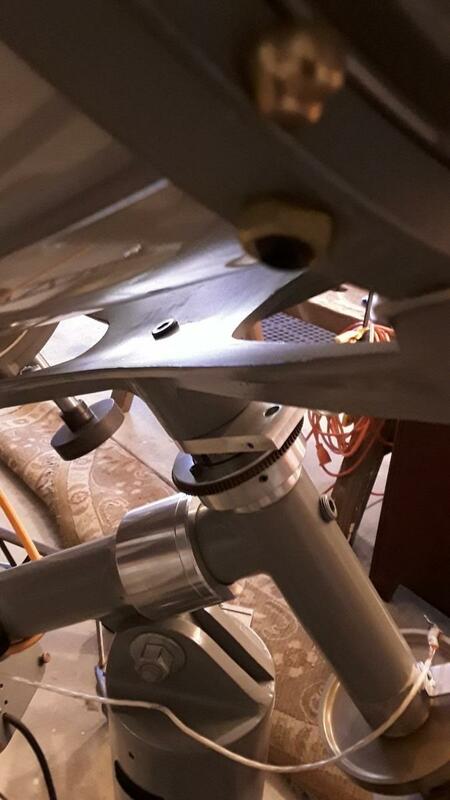 The caveat is that I can see no part of the focuser that, god forbid the gear disengages, the drawtube won't slip straight down into the telescope tube and bounce its way down onto the primary mirror. 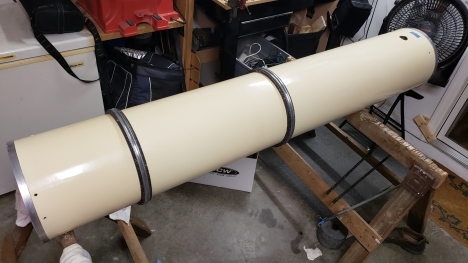 But now she's all cleaned up and ready to be re-attached as soon as I put some kind of compression ring at the top of the drawtube. 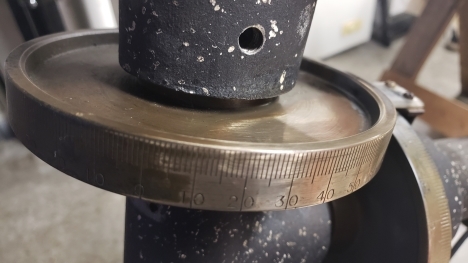 Since slightly bending the inner compression ring did not add tension to hold an eyepiece, I will come up with another solution, which could also double as a means to prevent the drawtube from sliding down through the focuser (maybe a hose clamp or something a bit more elegant). Also, I sat there for a half-hour two nights ago using the NeverDull on the brass ring and it was doing very little this time. I experimented with some 1000 grit automotive sandpaper to just knock off the top layers of the 60-year crud followed up by the NeverDull, and I think it's beginning to show some beauty again. On a side note, what are the ~5/8" holes just above the setting circles? It looks like it is to lock the RA somehow, but there are multiple locations. Cheers, and Merry Christmas to all in case I don't get to post again. Oh, and I'm taking the mirrors to get aluminized on the 28th. Edited by Guy Earle, 22 December 2018 - 09:51 PM. I hope everyone is enjoying family and friends at this time, and I thought I'd post a few pics. It seems like slow going right now because there's so much sanding and cleaning. I added a second "0" washer (see above) and the focuser now moves smooth along the total drawtube; one was just too narrow. And it is inelegant, but a simple pipe clamp works well to give the necessary grip on any 1-1/4" eyepieces. As a side note, three of the four old eyepieces that were with the scope have barrels that are now slightly out of shape, but using the clamp allows me to adjust and use them again. Also, the final restorer/cleaner and wax was used, and the tracks have been sanded smooth with 1000 grit. The base rings will be painted next and then the whole rotating ring reassembled. I also simply painted the finder rings and cleaned up the old finder, and I'm happy with the result. Edit: I added the original tube photo for comparison. Yikes. Edited by Guy Earle, 28 December 2018 - 11:27 PM. The holes you asked about in your photo are for the set screws which hold the cradle to the dec shaft. There should also be a setscrew(s) holding the dec housing to the polar shaft. By 1965 Cave changed this to a large bolt thru the GOP of the cradle into the end of the dec axis. And a hole in the dec housing thru which another large Allen head was bolted into the end of the polar shaft. Edited by KentTolley, 02 January 2019 - 02:19 PM. Holes on my 1963 mount are for 1/4" set screw to lock the cradle to the dec shaft. Set screws also lock down the dec housing to the polar shaft. By 1965 Cave changes this as well as a bunch of other changes to the Astrola mount. Edited by KentTolley, 02 January 2019 - 02:42 PM. Edited by KentTolley, 02 January 2019 - 02:40 PM. Thanks, Kent. Those mounts look so pristine they probably are better than when they rolled out of the shop. I've had to take the pillar to a metal fabricator to weld and back out two of the set screws that have rusted solid. I've used every trick I know from Blaster to cobalt bits, which broke when trying to drill them out. In the meantime I've reassembled the rotating rings and put the focuser and finder back. The mirror is being recoated, and once I get the motor housing fixed, which also has two broken screws in it, I can focus on the cradle and axis assembly. I'm waiting to put the final coat of wax on the OTA until all is done. The short cradle on my 1958 Cave 10" has no mounting holes or attachments of any kind that show. It would appear to be a press fit or a glue fit, maybe both. The other possibility is that bolts or screws were covered over with some filler before the unit was painted. 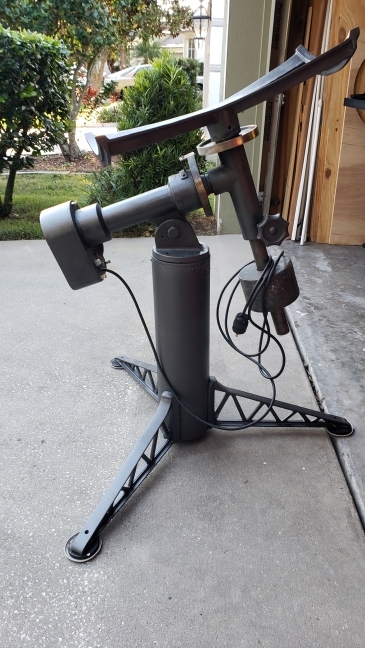 My mount is likely made with much older shelf parts, so I was wondering if any one can verify a much earlier cradle attachment to the DEC shaft. apfever - could you post pics of your 1958 Cave 10"? Usually Tom used a 24" long cradle for his 10" scopes. Your prototype sounds very interesting and may be revealing of the maker's design considerations along the way to his final Astrola mount. Oh this one is definitely a maker's design consideration before production castings. The cradle is the short version, it's all original from the observatory solid pier assembly to the OTA. I'll look for some string on it. I remember having a hot time with the seller in Kansas as he sold out a Pretoria eyepiece from under me while I was road tripping to get it. He was country also and we both ended up at our trucks with one hand inside, both on the phone, and about as flaked out a scope situation as I've ever had. I've talked to the brother and sister in law of the original owner and have quite the story on 'Herbie' the original owner who bought it in Cali in the 50's. The seller to me had bought the scope at Herbie's estate sale. The brother and sister in law were quite old when I talked to them a few years ago. I had another regular production 10" Cave that I sold local to a regular in this forum. Unfortunately I never did the side by side photos of the parts. Cave aficionados should see the relation. Turk summed up what I think as well in post #50. Ask if you have more questions. I'll take detailed pics of the saddle if you specify. Thanks apfever. 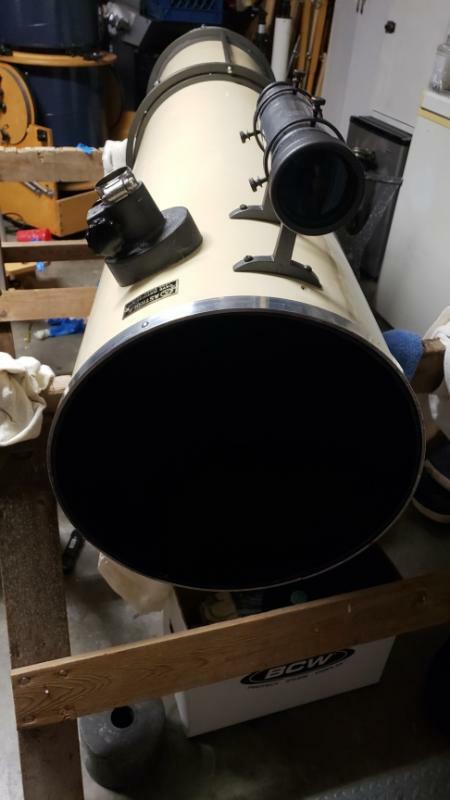 A very interesting prototype between the Telescopics mount that Cave used in the earliest years and later the first version of the Astrola mount. Your cradle looks like all the 12"cradles I've seen which apparently remained the same from the 50's to the end of Cave Optical. Apparently not much from your "prototype" remains in the first version of the Astrola mount. I always thought Tom Cave engineered his Astrola mount. Does anyone know for sure who designed it? Edited by KentTolley, 04 January 2019 - 02:41 PM. My 69 model a deluxe appears to be attached in this manner. My '58 Cave 10" f/7 also had the short cradle and both the Dec. and RA shafts appear to be pressed into their respective housings or possibly cast around the shafts. I bead blasted them while still attached to their shafts and there were no pins, set screws or other covered up or filled in hardware. There was no need for me to figure out how to remove the shafts as everything could be restored as is. Cave switched from the short cradle on the 10" models to the 24" long cradle during early 1959. Then that would likely mean mine was one of the early batches to change because the mirror is Feb of '59 and the original owner has first light as April 21, '59, so assembly was likely in March. I had to get a metal fabricator to take the four broken screws out, which were done yesterday and today. I picked up the pier this morning and dropped off the motor housing, costing me $47 in the end. I took a bit of time today to do something I haven't since my old 12.5" f/6, and that was to add velvet to the top foot or so of the tube, both to the Cave and my 16" dob to increase contrast. Way better than flocking paper IMO, and way cheaper. I want this thing to be a planet killer and really pop. 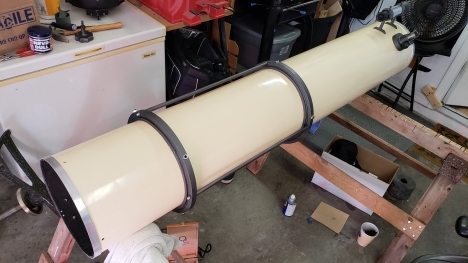 No, the secondary isn't in there since I don't have the mirror back, but the assembly has been cleaned and painted too. Question: what do you all use for wheels? I need them to lock, as it will be in my driveway, which has a slope albeit Florida grade (i.e. not much lol). When we had the house built in 2004 I specifically chose a lot that faced the ecliptic, figuring on rolling any scopes out. I'll have to either come up with some kind of block-wedge system to level them or adjust the altitude bolt accordingly. BTW, the cold front is rolling through tonight so it looks like tomorrow is going to be spectacular if Clear Sky Clock holds up. Sorry it has been a few weeks since any update. 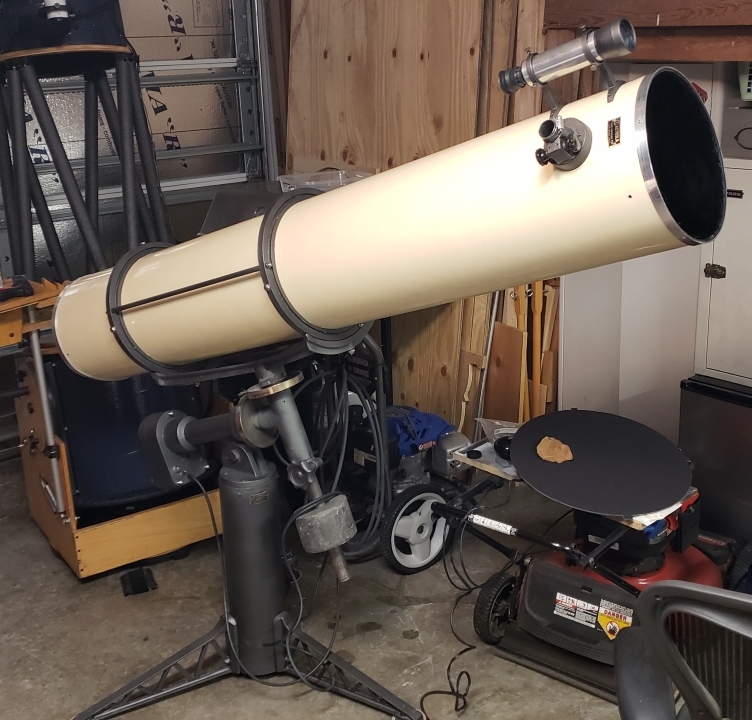 My spare time for astronomy has been devoted to getting my 16" dob tweaked for the annual starparty at the end of the month, so most of my time has been focused there (pun intended). 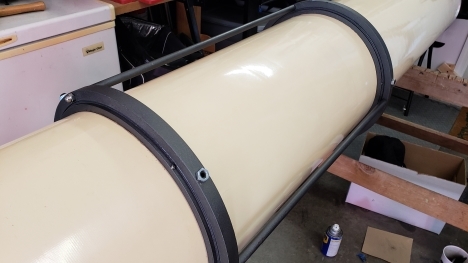 The tube is back together and so is the mount, with a first, rough coat of the soft iron over the etched primer. I'm going to have to loosen/replace the latitude adjustment bolt, so that and fully cleaning the setting circles, polishing the dec. axis and deciding what to paint the counterweight are next.. I'm still waiting for an update from Spectrum Coatings on the primary and secondary, so that is keeping any pressure off on finishing quickly. Question: what wheels do you all prefer to use? I will need them to lock, or maybe even use the levelers on blocks. I'm not sure yet. Edited by Guy Earle, 22 January 2019 - 11:11 PM.